A celebrated Chicago photographer has now imagined that journey through the eyes of the passengers on the Underground Railroad. Brandis Friedman: Dusky images of uncertain locations. A countryside obscured in twilight. An American terrain possessed by a troubled past. The photographs in Dawoud Bey’s new series at the Art Institute are dark. Literally dark. Dawoud Bey. “Untitled #2 (Trees and Farmhouse),” from the series “Night Coming Tenderly, Black,” 2017. Rennie Collection, Vancouver. © Dawoud Bey. We asked the artist about exploring the Underground Railroad through an art of darkness. Dawoud Bey, photographer: It’s very much meant to suggest what that experience of moving through the nighttime landscape might have looked like and felt like for those fugitive slaves who were moving through that landscape. I was trying to imagine the landscape through their eyes. Friedman: The title of the show is a reference to a Langston Hughes poem. Bey: I thought about that idea of blackness and the blackness of space, the blackness of the subject, and this blackness that he described – “Night coming tenderly / Black like me” – that this black space could be a place of tender embrace that’s moving these fugitive slaves along the path to freedom, across Lake Erie and Canada. Friedman: Dawoud Bey grew up in New York City. In the 1970s he documented the Harlem community. Dawoud Bey. 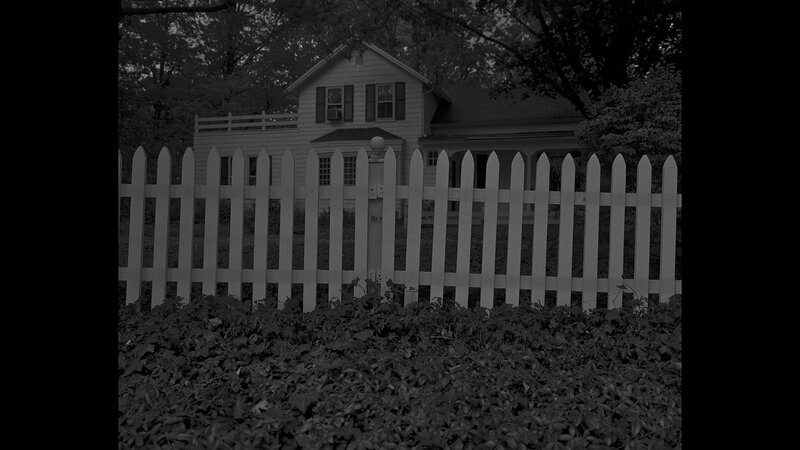 “Untitled #1 (Picket Fence and Farmhouse),” from the series “Night Coming Tenderly, Black,” 2017. Rennie Collection, Vancouver. © Dawoud Bey. He works in black and white, and in color. He has made street photographs, a series of student portraits and a meditation on the 1963 bombing of 16th Street Baptist Church in Birmingham, Alabama. A new book surveys more than 40 years of Bey’s explorations of people and places. We asked the subject of “Seeing Deeply” if the profound hearing loss he experienced as a child affected his work. Bey: If it has any effect on that at all, it would be that I know that I probably see more than most people, because I have to. For any sense that one loses, one overcompensates with another. So it’s not surprising that I’ve made my life through my eyes. Dawoud Bey. “Untitled #4 (Leaves and Porch),” from the series “Night Coming Tenderly, Black,” 2017. Rennie Collection, Vancouver. © Dawoud Bey. Matthew Witkovsky, Art Institute of Chicago: These works are gelatin silver, chemically made prints, very large, 5 feet across and they are printed quite darkly. They present landscapes for people who are lost, people moving through the land who don’t know where they are, and know that they want to get to freedom. Friedman: He took the photographs on location in northern Ohio. Bey: Some of the photographs, to the extent that we know, are actual Underground Railroad sites, and the majority of them are places in the landscape that I identified in proximity to some of those locations, where I could make work that suggested the movement of fugitive slaves through the landscape. Friedman: To accompany the exhibition, he chose related pictures from the collection of the Art Institute. Bey: I’m always aware of the entire museum environment. I’m aware that this exhibition exists in conversation with other objects in the museum, with other histories, and I decided I wanted to curate from the photography collection a group of photographs that amplify some of the ideas embedded in this work. Dawoud Bey. “Untitled #25 (Lake Erie and Sky),” from the series “Night Coming Tenderly, Black,” 2017. Rennie Collection, Vancouver. © Dawoud Bey. Witkovsky: Dawoud Bey is a quintessential photographer for our time and for the past several decades. He has given America the image of ourselves, in our fullness, in our richness, through our high school students, through our local neighborhood citizens, through pairings of people who hadn’t met before and with this latest series on the Underground Railroad and the American landscape, Dawoud Bey is showing us that every inch of the American land is marked by a fraught and complicated history which is also a history that is full of hope and promise. Bey: How does one make photographs about something that has already happened? How does one photograph the invisible? How does one visualize history and to make that history resonate? Friedman: For this artist, there are no simple answers. Dawoud Bey is a professor of photography at Columbia College Chicago. He is currently on extended leave from Columbia since receiving a MacArthur Fellowship, commonly called the Genius grant, in 2017. His new exhibition is called “Night Coming Tenderly, Black.” It’s in the Modern Wing of the Art Institute of Chicago through April 14.